Kentucky state law allows individuals to buy “1.4 consumer fireworks” as of 2011. This classification includes items such as Roman candles, firecrackers, and bottle rockets. But before you set them off, check and be sure your local ordinance has green-lit the use of such fireworks. A handful of local communities have put their own local regulations in place to discourage this state law. Beware of what is around. Only use fireworks outdoors and do not shoot fireworks close to buildings, cars or anything else around that could possibly catch fire. Make sure adults are in charge of the fireworks. Adults should handle the fireworks while alert and sober. Do not mix drinking of alcohol and fireworks. If there are kids around, be sure to instruct them to stay away from the fireworks and if they are interested in sparklers, provide adult supervision. Keep everyone away from the fireworks, not just children. Everyone watching fireworks need to stay away from where the fireworks are being ignited. Do not attempt to re-light a firework. If the display was a dud, leave it be. After waiting for it to cool—experts recommend 20 minutes—soak the “dud” firework in a bucket of water. In fact, be sure to douse all firework remains. Do not throw them away; soak them in water to be sure they are no longer hot or a threat. The individual who is the designated shooter should have safety precautions in place. Follow directions and never try to alter or combine fireworks. Keep a bucket of water, a fire extinguisher, or working water hose (or all three) nearby. Wear safety glasses and never lean over a firework while lighting it. If you're interested in fireworks for a Fourth of July celebration, you don't have to host your own event. There are plenty of places to go, things to do, and fireworks displays to enjoy in and around Louisville. Often, if you are simply looking for a fireworks display, it can be more relaxing to enjoy the booming lights in the sky when someone else is in charge. A lot of people prefer to leave fireworks to the professionals, which takes away the stress surrounding the explosives. Can we talk about fireworks in Louisville without mentioning Thunder? No way! Thunder Over Louisville is largest annual pyrotechnics display in North America. The fireworks and air show celebration takes place annually, every April, and marks the official launch of the Kentucky Derby Festival, weeks of parties, art fairs, and hot air balloons, all culminating with the legendary Kentucky Derby on the first Saturday in May. If you are in Louisville during Derby Season, be sure to get a Pegasus Pin and join in the fun. 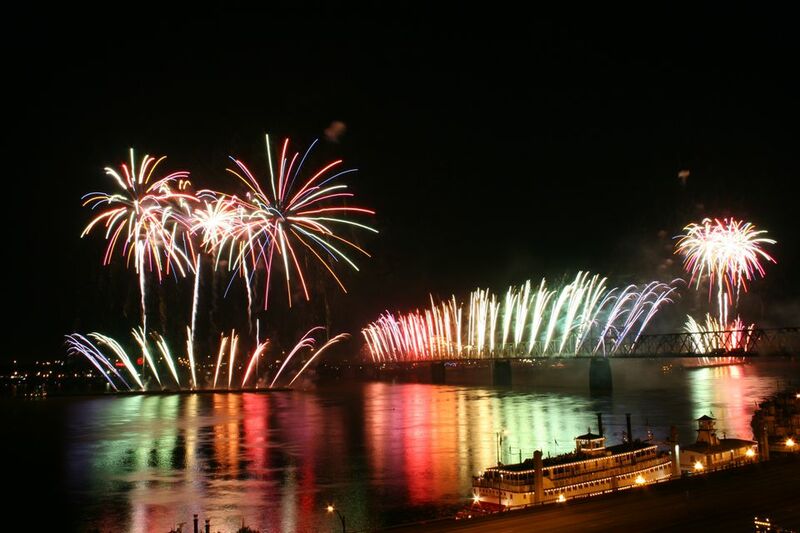 Over half a million people attend Thunder Over Louisville each year, and the banks of the Ohio River are filled with celebrants. It's a testament to how exciting (and important) Derby Season is around Louisville.